SPARTA, Ky. (July 8, 2017) – Kaulig Racing driver Blake Koch finished 23rd at Kentucky Speedway on Saturday afternoon after receiving heavy damage at the initial start of the race. The West Palm Beach, Fla. native never gave up and salvaged a respectable finish after starting 19th. Rain cancelled all on-track activity for the NASCAR XFINITY Series on Thursday, affecting three scheduled practice sessions for the No. 11 LeafFilter Gutter Protection team. Koch arrived at the track ready to practice, qualify and race on Friday. He finished 15th in the team’s only practice session on Friday morning before securing a 19th-place starting position in Friday afternoon’s qualifying session. As the race start time neared, heavy thunderstorms in the area forced NASCAR to postpone Friday night’s race to Saturday at noon. Having to adjust race strategy from nighttime to a day race, the team showed up Saturday ready to tackle the 1.5-mile tri-oval. As the field took the green flag, drivers began stacking up in front of Koch, causing an accordion effect. The chain reaction caused the driver of the No. 11 machine to receive front and rear-end damage and spin into the infield grass, along with several other drivers. With the heaviest damage to the rear of the No. 11 machine, crew chief Chris Rice brought Koch down pit road before he could complete a lap to fix damage to the car. He came back in on Lap 3 to continue damage repair, eventually restarting 36th on Lap 5. The caution flew again on Lap 7, which gave the team a chance to bring Koch back down pit road to secure some tape and change tires. The field returned to green just a couple of laps before the scheduled Lap 25 competition caution. Koch was scored 26th on Lap 25 and came down pit road for fuel only during the caution period. He restarted 23rd with 15 laps remaining in Stage 1. Koch continued to fight for position, finishing 26th when Stage 1 concluded on Lap 45. Under the caution, Koch came down pit road for a four fresh tires, a wedge adjustment and fuel. He restarted 22nd when the field returned to green to start Stage 2 on Lap 52. Koch had advanced to the 16th position by Lap 57, while fighting to get the car to turn in Turns 3 and 4. He ended Stage 2 in the 21st position. Rice brought Koch down pit road under the caution on Lap 95 for wedge and air pressure adjustments. As Koch returned to the track, he said he felt a vibration and was forced to come back down pit road to change tires and fix some tape on the bumper of the car. He restarted 29th on Lap 100. The caution was displayed again on Lap 103 for a spin in front of Koch. As other cars checked up to avoid the spin, Koch got into the back of the car in front of him, resulting in significant front-end damage. The team pitted on Lap 107 to work on that damage, putting Koch 27th for the restart on Lap 110. Koch raced his way up to the 23rd position by the time the next caution flag was displayed on Lap 130. He reported he gotten really loose over the run. The team decided to stay out under the caution to take the wave around, leaving Koch 23rd for the restart on Lap 137. The Kaulig Racing driver maintained the 23rd position until he was forced to pit for fuel under green on Lap 166. Just as Koch hit pit road, the caution flag was displayed. The team decided to take right-side tires and fuel on that stop before coming back down pit road on Lap 172 to take left-side tires and fix tape on the bumper of the car. Koch restarted 25th with 28 laps remaining in the event. Koch gained two positions to run 23rd with 20 laps remaining in the event. He continued to gain on his lap times in the closing laps, eventually crossing the finish line 23rd. Koch and the No. 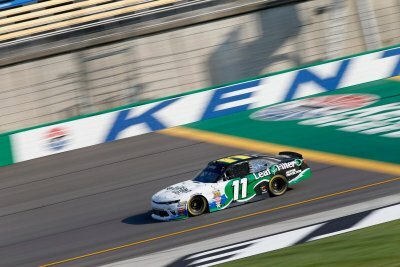 11 LeafFilter Gutter Protection team leave Kentucky Speedway 12th in the NXS championship standings. The team returns to racing action on Saturday, July 15th at New Hampshire Motor Speedway.